This little lace bag is made to accompany the Waves of Lace Shawl but is beautiful all by itself. This pattern uses the same techniques as the shawl but is altered to work knitted in the round. 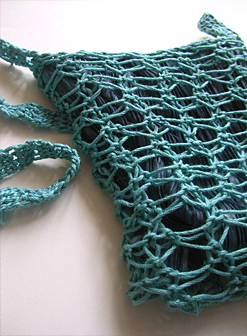 Use up the left over yarn from the shawl with this beautiful lace handbag. Color pictures and detailed written instructions are included in the pattern. This pattern includes instructions for adding the lining and blocking the finished bag. Stitch Techniques: E-wrap, purl, yarn over, knitting as a flat panel, knitting lace in the round and flat panel bind off.